Spray a shallow roasting pan with cooking spray. Note: You may need two roasting pans so vegetables aren't overlapping. Spread mushrooms, zucchini, yellow squash, bell pepper and onion covering the pan(s) in a single layer. In a small dish, combine vinegar, oil, garlic and rosemary; brush evenly over vegetables. Bake vegetables for 15 minutes and toss. Continue baking 8 to 10 minutes longer or until vegetables are browned and tender. Spoon 1 cup spaghetti sauce over the bottom of a 13 x 9- inch baking dish or lasagna pan. Arrange 4 pieces of lasagne (3 lengthwise, 1 cut and placed width-wise) over the sauce. Cover lasagne with 1 cup sauce. In a medium bowl, combine ricotta cheese, spinach, egg white, black pepper and red pepper flakes. Drop half the cheese mixture by spoonfuls over sauce; arrange half of the roasted vegetables between spoonfuls of cheese mixture. Sprinkle 1 cup mozzarella cheese and 1/4 cup parmesan cheese over the top. Arrange another 4 pieces of lasagne (in the same manner) over shredded cheeses, pressing lightly; top with 1 cup sauce. Spoon remaining cheese mixture, roasted vegetables over the sauce and sprinkle 1 cup mozzarella and 1/4 cup parmesan over the top. 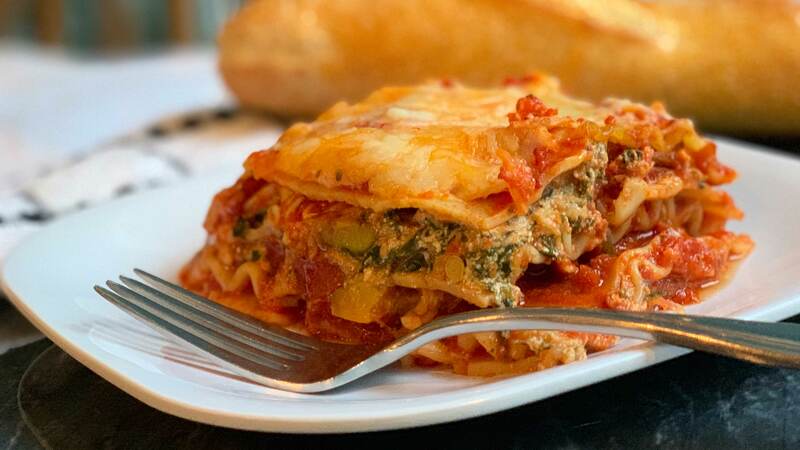 Arrange remaining 4 pieces of lasagne over the top in the same manner and top with 1 cup spaghetti sauce. Cover lasagne with foil; bake 45 minutes. Uncover; sprinkle with 2 cups mozzarella and 3/4 cup Parmesan cheese; continue baking, uncovered, 5 minutes or until cheese is melted. Let stand 10 minutes before serving.